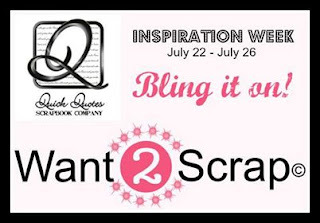 Blog Quick Quotes: Want2Scrap Inspiration Week Additional Giveaway! Want2Scrap Inspiration Week Additional Giveaway! Would you like another chance at a fabulous prize from our Want2Scrap Inspiration Week? Head on over to the Want2Scrap Blog here and check out our giveaways!!! there's still time to comment on each of the posts. Comments close this evening just before Midnight PST. It was great looking at all the projects. Great projects! Enjoyed seeing each one!